On May 11, President Donald Trump is scheduled to deliver a speech addressing prescription drug prices. The details of the speech have not been released, but he is expected to discuss proposals to combat rising drug costs. As president-elect, Trump famously said that the drug industry was “getting away with murder.” As a candidate, he campaigned on ideas to address these rising costs directly, such as allowing Medicare to negotiate drug prices with drug companies. However, while in office, President Trump and his administration have taken no serious action on the issue. Even worse, the pharmaceutical industry appears to have a firm grip on the administration, wielding influence in top positions. Prescription drug prices have continued to skyrocket under the Trump administration. A recent congressional report found that the prices of the 20 most-prescribed drugs under Medicare Part D have increased substantially, having risen 10 times faster than inflation over the past five years. On average, manufacturers increased prices for these drugs by 12 percent each year. As a result, during the same five-year period, 12 of these drugs saw price increases of over 50 percent, and 6 saw price increases of 100 percent. These price increases not only affect Medicare beneficiaries; they rack up costs for the federal government and put a strain on the health care system as a whole. Another alarming analysis, which was conducted by Pharmacy Benefits Consultants, found that over the past 14 months, 20 prescription drugs saw price increases of more than 200 percent. * The study found that one prescription skin care cream, SynerDerm, increased by a staggering 1,468 percent. While less extreme than this, some of the most popular prescription drugs also experienced notable price increases. For example, Humira—the world’s highest-selling drug, used to treat inflammatory conditions such as arthritis—saw a 19 percent price increase during the same time period. The trend is clear: Pharmaceutical companies are not bringing down drug prices under Trump. Indeed, companies continue to increase prescription drug prices, even as they are experiencing monumental profits. Seven top pharmaceutical companies—AbbVie, Amgen, Novartis, GlaxoSmithKline, Bristol-Myers Squibb, Eli Lilly and Company, and Biogen—collected a cumulative $12.1 billion in profits in the first quarter of 2018. This was a 29 percent increase from the same time last year. Another prominent drug company, Pfizer, reported $3.6 billion in profits in its first quarter alone, a 14 percent increase from last year. And these excessive prices are harming patients. Extensive research shows that patients often skip essential medications due to cost. This not only threatens patients’ health but also eventually imposes additional health care costs on the federal government. It is not surprising that recent polling reveals that more than half of Americans believe that addressing prescription drug costs should be a “top priority” for the administration, while 72 percent think that pharmaceutical companies have “too much influence” in Washington. In contrast to his rhetoric as a candidate, President Trump has largely stopped confronting the drug industry for its high prices. Other issues notwithstanding, Trump’s appointments of key officials indicate a grim future for drug prices. His secretary of Health and Human Services (HHS), Alex Azar, previously served as a top executive at Eli Lilly from 2007 to 2017; under his leadership, the company was involved in a class-action lawsuit after dramatically increasing the price of insulin. Working closely with Azar on drug prices is Dan Best, a former CVS Health vice president and Pfizer executive who has significant financial ties to pharmaceutical companies. Trump also recently appointed Joseph Grogan as the Office of Management and Budget’s associate director of health programs. Grogan is a former lobbyist for Gilead, a drug company infamous for charging $1,000 per pill for its hepatitis C cure. The pharmaceutical industry’s representation and influence within the Trump administration do not suggest a true desire to address the primary cause of high drug costs for patients: the prices set by pharmaceutical companies. Indeed, the pharmaceutical industry’s influence in the administration is already paying off—for the industry, not patients. Pharmaceutical companies saved billions of dollars in taxes after Trump signed last year’s tax bill into law. According to a report released by Sen. Cory Booker (D-NJ) in early April, pharmaceutical companies have a long history of using profits to reward shareholders, and the manufacturers’ anticipated savings from the tax bill appear to be no different. The report notes that five of the 10 largest pharmaceutical companies are using their savings from the tax bill on $45 billion total in new stock buyback programs to benefit shareholders. Yet none of the companies in Booker’s analysis announced plans to use tax savings to lower drug prices for consumers. In fact, several of the companies raised drug prices in 2018—with more than 1,300 recorded increases instituted on January 1. None of this should be surprising given the administration’s actions to date, which have only worked to undermine patients’ access to prescription drugs. Between Trump’s repeated attempts to sabotage the Affordable Care Act (ACA) and his efforts to impose work requirements through Medicaid waivers, his administration has willingly sought to shift health care costs to patients. And the administration’s attempts to repeal the ACA and cap Medicaid funding—had they not failed—would have resulted in tens of millions of Americans becoming uninsured and facing worse access to affordable prescription drugs. 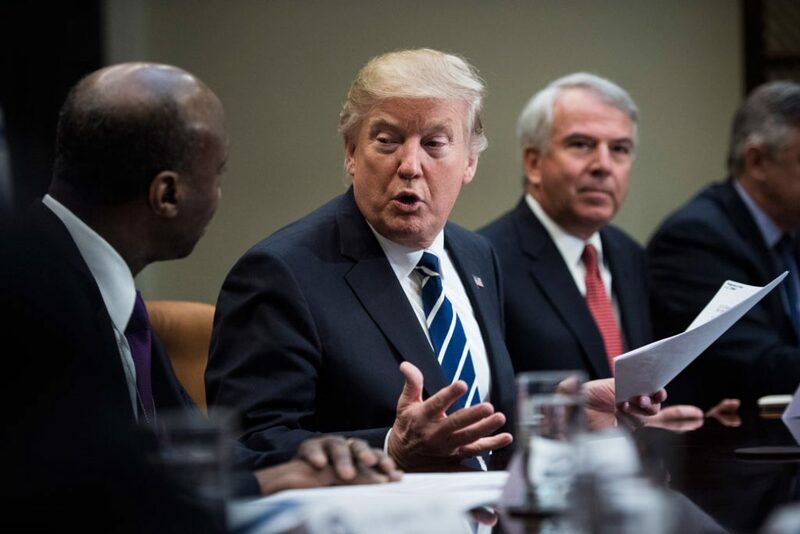 Despite previously supporting more aggressive proposals, such as Medicare price negotiation to reform drug pricing, during his May 11 speech, Trump is expected to discuss significantly less ambitious ideas on drug prices. These may include smaller-scale proposals similar to those discussed in his proposed fiscal year 2019 budget, such as testing new ways to pay for drugs under Medicare and Medicaid. One proposal seeks to require Medicare Part D plans to share the savings from drug rebates with patients through lower drug costs rather than lower premiums. This measure has found support from pharmaceutical executives seeking to deflect blame for high costs onto other actors in the health care system. Recently, industry executives have started to argue that the focus should be on affordability instead of prices. However, the current lack of affordability ultimately stems from the high prices; although shifting costs to insurers could lower costs for consumers at the pharmacy, it would also drive up consumer premiums. Therefore, by focusing on affordability rather than prices, the pharmaceutical industry is protecting its profits by spreading the costs of expensive drugs to all consumers through higher insurance premiums. While some of Trump’s proposals could have limited positive effects, these changes are not nearly aggressive enough to address the real problem—the underlying prices themselves. As a result, it is no surprise that a recent report indicates that “the drug industry isn’t worried about any of these” proposals. Despite his tough rhetoric on drug prices, President Trump has failed to take meaningful action. Unfortunately, it seems clear that the pharmaceutical industry’s influence in the White House has led Trump to back away from the bolder proposals he supported during his campaign. Meaningful progress on this issue would require lowering costs systemwide in addition to lowering costs for individuals. In other words, reforms must directly address prices and price increases. While more limited proposals may have positive impacts, significant progress is only possible if Trump tackles the actual prices that pharmaceutical companies have set. Unfortunately, there is little evidence suggesting that President Trump will stand up to the pharmaceutical industry and take real action to bring down drug prices. His inaction imposes significant financial burdens on consumers and threatens patients’ health. *Author’s note: Although these list prices for drugs do not reflect negotiated rebates and discounts, they still matter. For instance, these prices are often paid by the uninsured and are used for purposes of calculating coinsurance. Furthermore, drug manufacturers are not transparent about the prices negotiated with payers.